Haha - I'm glad Buddy's enjoying his new beef diet. I hope it helps. MacDuff has a red beard, but I think it's from his kibbles. The groomer always gets him white again, but it never lasts. i have seen the angel eyes for years in the pet catalogs but i didn't know it was for the beards too. those were some great reference articles. i think it may be just the think to fix buddy's beard. i can hardly wait to know if it works !!! if so i may try it on kirby's blood stain. thanks for keeping us updated !!! I'm sure there is something better for the picky eater but that is really interesting (for lack of a better word) about the beard change! I guess it is amazing that they don't have more issues considering the things that they put those pretty little noses in! I did some reading on this product. It contains Tylosin as tartrate which is an antibiotic like erythromycin. This is why it works on eye & beard stains. The antibiotic destroys a red yeast bacteria that may be the cause of the problem. The articles go on to talk about dogs getting a bacteria after possibly eating garbage or feces. I started thinking back to when Buddy's beard began to turn red. I knew he hadn't eaten garbage, but last summer when the wild turkeys were in the yard I caught Buddy eating the turkey poop. That might explain why this all began happening to him. Bottom line... there maybe other products less invasive out there to help to get a picky dog to eat. I don't think I would have given it to Buddy if it weren't for the red beard problem. 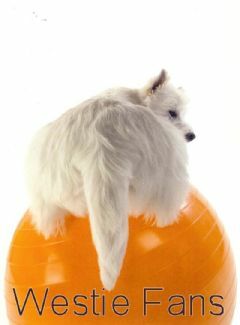 Buddy is living proof that all the rules go out the window when it comes to Westies. My daughter's Westie is a picky guy as well. We are going to have to try it! Thanks for the update! I would say you are right about the hair being permanently stained ... but the new hair coming in IS white. My goal is for that new hair to not stain at all. Licking of the feet is the big problem with allergies. Westies are the Poster Child for Allergies. My Vet had me give Buddy 1 tab Benedryl 2xday for allergies. She thought the stain, thus the wet beard, was related to licking. When Buddy licks he only seems to lick at night while we are all sleeping, so we can't catch him, so I am starting to give him the Benedryl at night before bed. His feet are stained only very slightly, and just recently. I was told by another westie owner that the stain is saliva related and that it affects the hair follicle, so once its there its there for good! Ill be eager to hear if this works, as Jess has a brown beard and paws where she has allergies. that little !!! he's not a eater.......... all along he's been wanting to eat a !!!! well i don't think he will be a picky eater anymore !!!! i'm so glad you found out what he will eat!! i hope the angel eyes works on his beard. i wonder if it will get the blood stain off kirby's beard??? i hate that blood stain!!!! Well, I broke down and purchased Angels' Eyes for Buddy's beard. All I've read about the staining on the beards, Angel Eyes was the product recommended. I've been procrastinating because you put the powder on the food. Everyone knows Buddy does not eat his food! Kibble?? Forget it!! The Angel Eyes arrived, and before I could get the top off the bottle he was standing up at me trying to get at it!! WHAT?? So I put a little in the cap to see what he would do. He first wanted to roll in it and then he chowed down!! HUH?? BUDDY? There was even a sample dog biscuit in the shipment. He devoured it before I could even see what kind it was!! WHAT?? BUDDY?? Big test... put the powder on his kibble and see what happens! WHAT DO YOU THINK HAPPENED?? YES!! He ate it ALL!! And LICKED THE BOWL CLEAN!! In case you don't know, Angel Eyes is dehydrated beef liver! That's been my mistake... he's a BEEF man!! LOL!! I hope you enjoyed this as much as I have. Westies are always surprising us! I'll let you know in about 4 wks if the Angel Eyes works on the beard!